What formation do we play? How do we fit in Ramsey, Ozil and Wilshere along with Sanchez in one team? How can we find a way of playing in big games? All questions that are usually answered in pre season when a manager can experiment with his players, formations and try new things. The problem was, the chance never presented itself due to the World Cup – Mesut Ozil didn’t play a pre season game and that in itself was a problem. 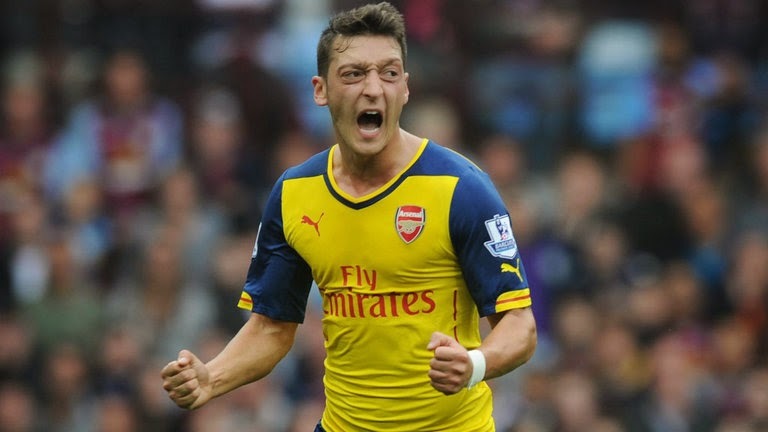 I think and have always thought that Mesut Ozil will come good and I was absolutely delighted to see him run the game yesterday at Villa park – he was outstanding. He passed the ball well, created a chance and scored a goal. He was always available and often got in between the lines but also dropped back to get the ball from our defence to start attacks – it was a master class. It was obvious to see that playing slightly more centrally (but still being able to drift wide, as he did when creating Welbeck’s goal) is his best position and we saw as the game went on, his confidence increased and long may it continue. But in all honestly, who can blame Wenger for trying to fit in Ozil, Ramsey and Wilshere in the same team by playing Ozil out wide – Wenger being in Brazil during the summer would have seen a lot of Ozil playing out wide and with the amount of pressure that Jack Wilshere has been under all summer and probably all year, who can really blame the manager for trying to fit them all in? It is just a shame that pre-season was non existent and we were not given the chance to test a few systems out then. It’s a great problem to have, and with injuries, having several players who can play across the midfield and attacking positions can only be a good thing but it will be very interesting to see who starts against Spurs next week and away at Chelsea the week after – Ozil had his best game in ages yesterday afternoon but Jack Wilshere had his best game in ages at home against City the week before – could it be Aaron Ramsey to miss out? Surely Sanchez has to come back in? Where does Theo fit in? So many questions……this is why I’m not a football manager and a supporter on twitter!